Atlanta's Botanical Gardens is displaying awe-inspiring mosaiculture sculptures - massive snakes to goddesses covered in beautiful flowers. NBC's Thanh Truong reports. ATLANTA -- Hunting for unicorns? You'll find one at Atlanta's Botanical Garden, its mane and tail flowing as it stands in a grazing pose. It's a sculpture, but a living one, covered in a mixture of helichrysum and carex plants. "It's like a fairy tale come to life," said Mary Pat Matheson, executive director of the garden. The unicorn is part of the garden's new "Imaginary Worlds" exhibit: nearly 20 sculptures spread throughout the blooming garden grounds in midtown Atlanta. The sculptures, which include a massive goddess, an ogre and twin cobras, are specimens of what is called mosaiculture, a form of horticultural art incorporating plants and flowers mounted on sculpted structures. And they are capturing the imagination of visitors of all ages. "Sometimes as adults we want to act so sophisticated and you'll visit the garden and come around the corner you'll see the cobras or the ogre and all of that adult sophistication melts away and it's like, 'Oh! Where the Wild Things Are,'" Matheson said. (Watch the video above). 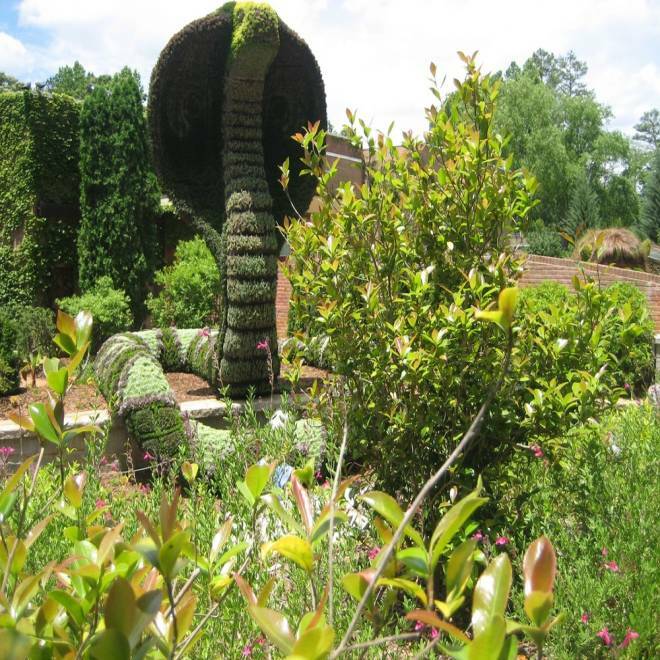 The massive snake sculpture is 18 feet tall and is part of the Atlanta Botanical Gardens Imaginary World exhibit. The sculptures were created by International Mosaiculture of Montreal. Matheson says she saw some of the nonprofit's work almost a decade ago and had been trying to bring them to the Atlanta Botanical Garden since. The current exhibit in Atlanta is the group's first in the United States. And since opening in May, attendance at the Atlanta Botanical Garden doubled compared to the same time frame last year. "It is amazing, I don't know how they did that. I can't keep anything growing in my house, so how did they get them to be like that? They're huge!" said Kati Gardner who viewed the exhibit with her two children. Beauty aside, the size of several of the sculptures is striking. The snakes are both 18 feet tall. The Earth goddess is 25 feet high, covered with 40,000 plants and weighs 29 tons. 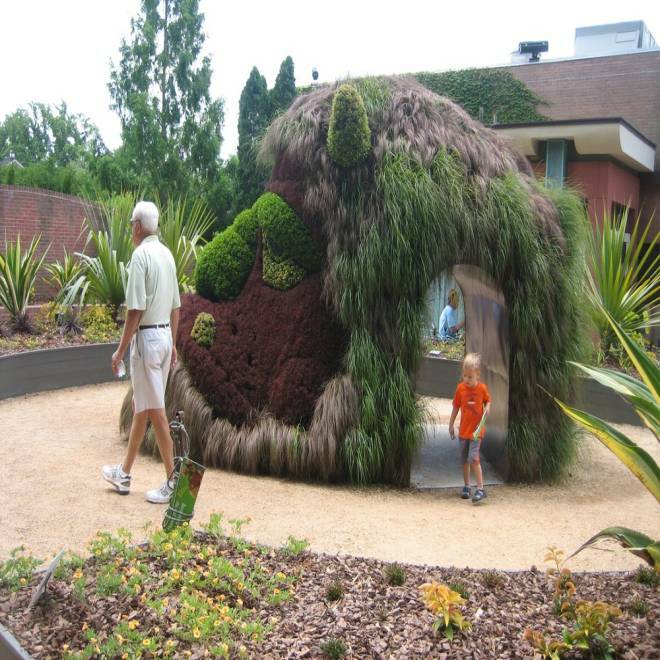 A child walks through the ogre sculpture that is part of the Atlanta Botanical Gardens Imaginary World exhibit. "She's humongous, she's very impressive," said Ford Hester, an assistant horticulturist. Ford is one of seven staffers assigned to maintain the sculptures. He says there is plenty of pruning, shearing and watering involved. The bigger sculptures like Earth goddess and the cobras have internal irrigation systems that help sustain the mounted plants. Without such a system, the sculptures would suffer under the Georgia heat. The exhibit runs until October.